Joseph Kosinski was so hot a property earlier in the year based on Tron buzz that the Mouse secured the rights to his graphic novel for a future adaptation. At the time, not many knew that Marvel had a channel on YouTube that was filled with fun things to watch. The reports that we broke here about S.H.I.E.L.D. eventually getting their own film were given more validation Marvel's Suits seemed to indicate there was one in the planning after "Avengers" release. We got the official date for Andrew Stanton's "John Carter of Mars" when fall finally came. Our very own Decadent Dave reviewed "The Expendables" and felt the love for all things Eighties. When we first heard the idea of an X-Men film set in the 60's, I loved it and it turns out that it was true. Blue Sky published an exclusive interview with Janet Scott Batchler, who wrote one of my all time favorite screenplays: "Smoke & Mirrors" that gives you insight into writing and this particular writers perspective on it. "Prep & Landing" garnered a lot of awards this year as well as great ratings for ABC and WDAS. Pre-Tangled, this was the best thing that the animation studio under Lasseter had done. "Toy Story 3" went on to make a billion dollars for the film division, thus ensuring that the Lamp's winning streak continued. The poster for Tokyo DisneySEA's "Fantasmic!" was released. A detailed look into the narrative of DCA's "World of Color" was focused on here. There was quite a debate as to the story that was told through this show with all its changes during the testing process and we wanted to set the record straight. A decade of Pooh was celebrated in Tokyo and no, I'm not being dirty. DisneySEA celebrated its ninth anniversary and has never looked better. That's saying something when referring to this park. The end of one of many mistakes happened in DCA as fall came around. We discussed some of the new theming and narrative behind the designs and architecture of Disney California Adventure. Disney's smallest Magic Kingdom styled park had its fifth anniversary as it planned for the future expansion of the park. We clarified what exactly was the marketing of "Tron Legacy" was going to be like at World of Color. My favorite soundtrack of the year was also the best soundtrack of the year. George Lucas in his effort to make even more on Star Wars announced that Lucasfilm would release the films in 3D over the coming years. What could be next? The Oriental Land Company turned half a century. We examined the various film divisions of the Walt Disney Studios and what their responsibilities were. In a surprising move, ABC announced a television series based on the Incredible Hulk. In an even more surprising move, Guillermo del Toro actually had time to be involved in it. More rumors about Lucas creating another trilogy of Star Wars films. And on a similar note, we reported that George was going to convert the Indy series to 3D and it could even be announced as soon as November. That date came and went, but we stand by the report that they will be converting the films to 3D. They may have not announced it yet, but I have solid sources that tell me it's not a matter of if, but when it will be official. So rant all you want haters, I STAND BY what I report. It will happen. We shared some beautiful Christmas commercials that have promoted the holidays at the resorts around the world. It seems that not everything being done at DCA is a step forward. Please fire whoever came up with this and hire the people that do Tokyo Disneyland/DisneySEA's entertainment. We all learned what John Musker and Ron Clements were doing now that TPATF was completed. I've known bits and pieces of this but not the exact book/name of the future film. And then we learned more. Our own Tron Unit revealed a juicy rumor about "Tron Legacy" that turned out to be true. Disney announced that "Tron Uprising" would premiere on Disney XD in 2012. The Walt Disney Company made it official about Shanghai Disneyland. The reviews for "Tangled" started coming in and surprising to some, they were good. Real good. I lot of people couldn't understand why Brad Bird would do a Mission: Impossible film. We could. Not only did we get to see "Prep & Landing" again this year, but they added a little short that gave us more time with Lanny and Wayne. DCA is nothing if not a work-in-progress, but the good news is that it's continually improving. Just not as quickly as some might want it to. And lastly as it came out, "Tron Legacy" was reviewed by Tron Unit and something was found lacking. But not something that would prevent him from seeing it four or five times more. 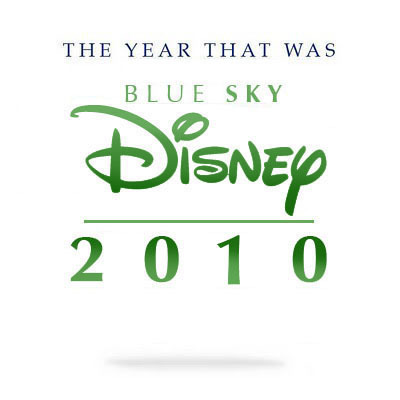 And that was the year that was Blue Sky Disney. Or at least some of the things I and others found interesting. No mention of the Expendables review even though it made the Honor Roll? You're getting old, Barney. You need glasses. It wasn't there when Honor first posted it last night just like he changed the erroneous graphic that said the year that was Bluesky Disney 2020. Honor needs glasses because his vision sure isn't. Honor pulled a Lucas and keeps trying to change history.